We arrived by plane from Bengaluru and found the Atithi Guest House off MI Rd. It’s about one kilometer from the Pink City, which is surrounded by a wall and houses several markets. We had chosen to fly to Jaipur of the three major Rajasthan cities, Jodhpur, Udaipur and Jaipur, because it seemed central. 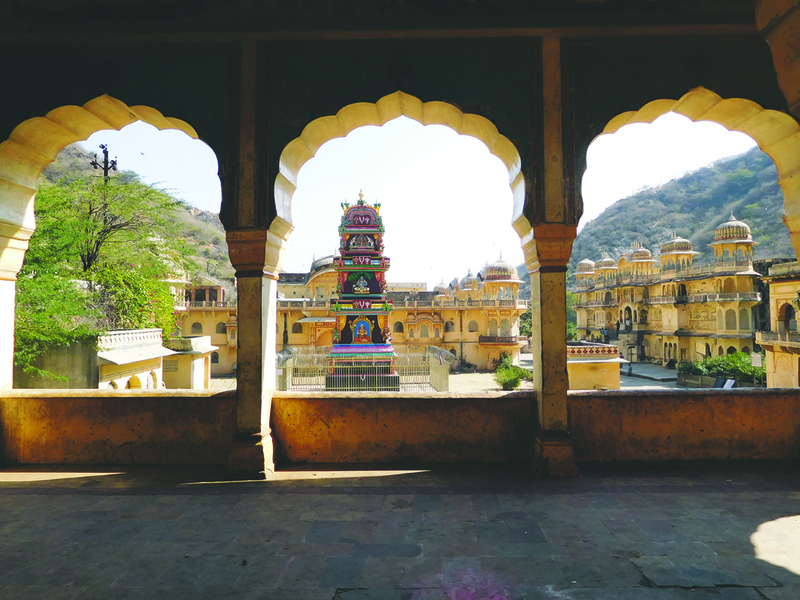 Later we would discover to-die-for Udaipur but we’ll save that for our September issue. We took a Tuk Tuk, a motorized rickshaw, to the Pink City through some of the worst traffic I saw in India. We entered through New Gate, a large pink structure and turned right to Bapu Bazaar. 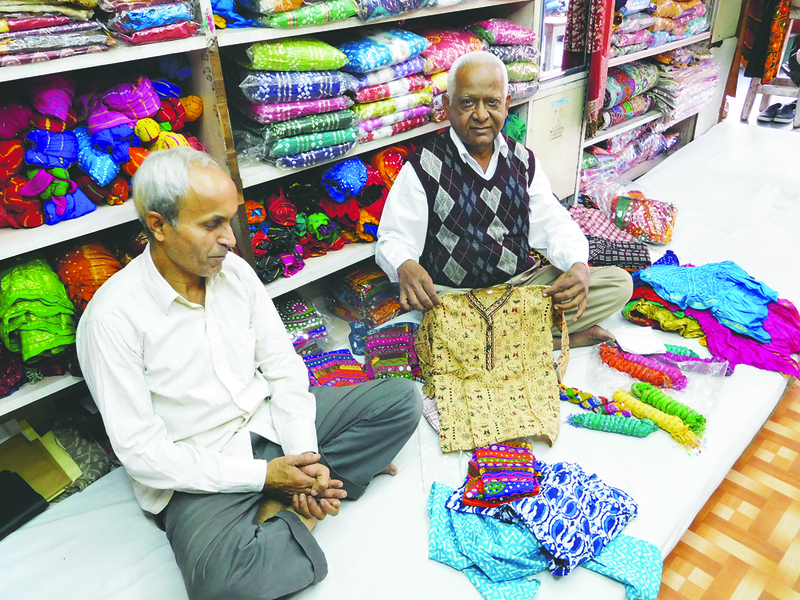 The sidewalk was safe and almost empty and every shopkeeper stood in our way showing us a pashmina and begging us to enter to “just look.” After a while we relented and entered a shop in which we met the owners sitting on the floor surrounded by their wares. Turns out they’re brothers and after ordering tea for us, they engaged Irwin in conversation about India. We ended up choosing cute Indian togs for our grandkids. We found the Ghanesh restaurant for lunch, featured in our Lonely Planet Guide, climbed a steep stone staircase at No. 10 shop. It was a scary climb for me. When we reached the roof, we looked down on the poor people living below in what looked like a garbage dump. Once in the tiny resto we had trouble explaining that we wanted a bottle of water. The guy kept suggesting coke and beer but finally, bottled water surfaced. We had three veg dishes, one of them cashew based and another with white cheese and veggies… huge portions and well spiced. We then went back to walking along the market streets. There are shops on both sides. There’s an entire street for party supplies, one for costume jewellery, one for silver… you get the picture. Unfortunately we stopped following the Lonely Planet walking guide and ended up in a “cardboard box” street with a lot of garbage. After asking directions several times, we returned to the corner and turned up towards Johari Bazaar. The bazaars became more crowded and the shops endless. I’ve never been in a bazaar like this one — the throngs, the hundreds of shops with similar wares. A guy sitting on the street sold me colourful bangles for 12 cents each. He said I was his first customer. If your eyes happen to fall on anything, the shopkeeper is instantly in front of you telling you there are more colours inside and avoiding the price, which can vary greatly. After an hour or two, we just couldn’t adjust to the crowding and I found the walking difficult. This huge expanse of walled city is called Pink City because its walls and most of the buildings are pink. There’s a Pink Toilet, very clean for a public toilet. We took a bumpy Tuk Tuk back to our hotel, and the traffic was unbelievable. We got so close to cars and motorbikes there was hardly space to pass. And the honking! It’s bedlam. At one point I covered my ears but then I needed my hands to hold my chest and stomach as we lurched along. 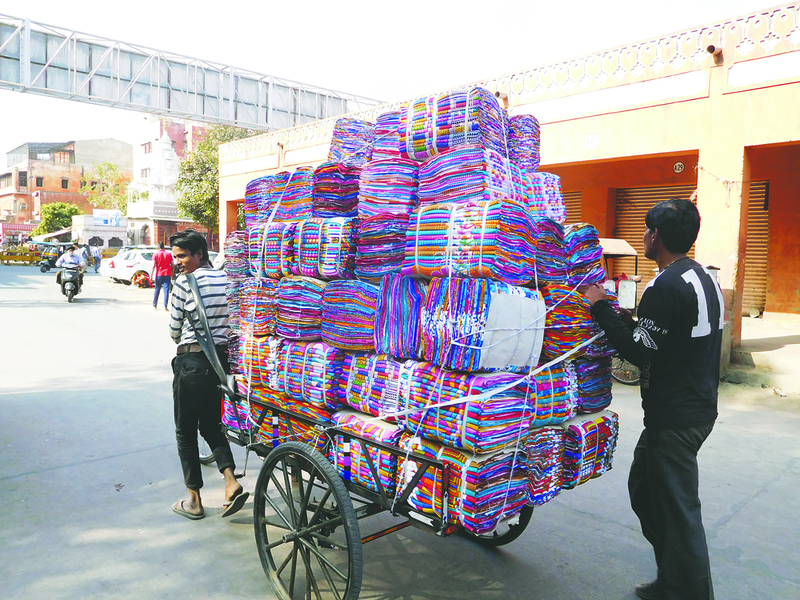 My advice on shopping in India: Don’t buy anything until you get to Jaipur. And we didn’t even graze the surface of The Pink City. The day began when our Tuk Tuk driver, Naresh, picked us up at 9am for the day’s excursion. We had met him the night before when he drove us to our hotel. We liked his safe driving style and the fact that he spoke English. This is the best way for independent travelers — having a driver for the full day to take you to the sites. Naresh drove us to the Amber Fort and Palace, ten kilometers from our hotel. When we arrived, we chose to walk up the stone staircase instead of taking a jeep or an elephant up the road route and marveled along the way at the huge peach-coloured edifice that rises above the rocky terrain. We were hounded by hordes of trinket-sellers along the way. 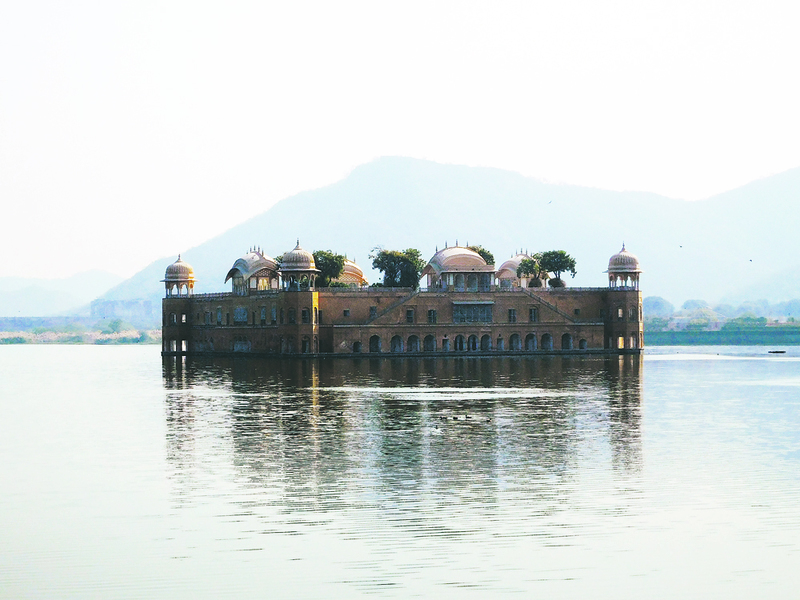 After the fort we stopped to view the Jal Mahal, a grand red sandstone palace that sits in the middle of Man Sagar Lake where we were met by more vendors. I bought bangles from a guy who laid his wares out on a mat on the pavement, just like the guy in the Pink City. Next it was on to the Galtaj Temple, known as The Monkey Temple. It’s a sanctuary for sacred monkeys that roam freely around the temple grounds, set majestically in a rocky outcropping and featuring a holy pool where devotees bathe in spite of the garbage in the pool. Boys study there as well. 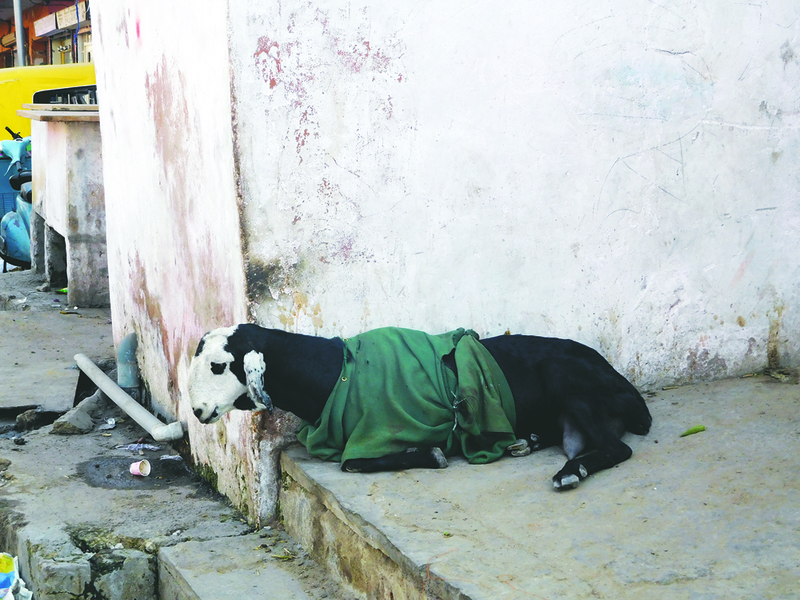 There are many cows, both at the site and along the narrow road that leads there. It’s in the countryside in a wooded area. The monkeys don’t bother you and will sit on your shoulder if you feed them. We declined. Next it was time for lunch so we went back to the Pink City. I’d heard about a shop that sells quality cotton women’s clothing so we had Naresh drop us there. It’s in a high-class building that includes an English book shop and toy store. The word seems to have gotten out — it was full of tourists. The building boasts a café, where Irwin enjoyed a coffee as I filled my carry bag (as they call shopping bags here) with colourful cotton tops. It was time to go back to the hotel and pack, as we were leaving for Udaipur through Bundi, the halfway point, the next morning. We’d hired a driver, Naresh’s friend, who spoke no English, and planned to stay overnight in a guesthouse in Bundi. The eight hour trip one way cost us $200. For dinner, we discovered a terrific restaurant right next door to our hotel, which the hotel staff had failed to tell us about, having preferred to promote the mediocre hotel resto. The food was mouth-watering, the prices excellent, the service impeccable and a vocalist serenaded us with popular Indian songs. They even had fresh pineapple, which our hotel did not, claiming it was too hard to cut up. 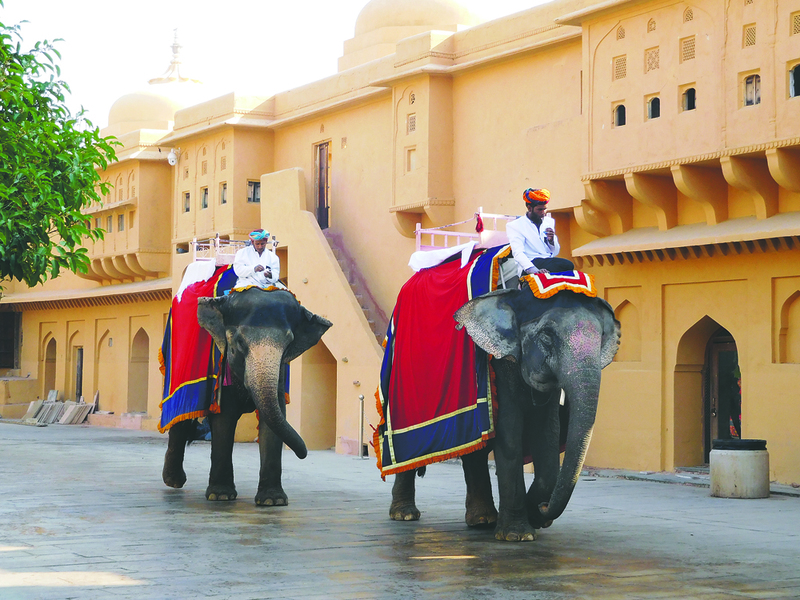 Be the first to comment on "Times and Places: Loose in the Pink City of Jaipur, India"